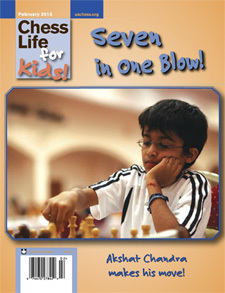 I will like to share that my article regarding my first GM win was published in the United States Chess Federation’s (USCF) Chess Life for Kids publication! A mention also appeared on the USCF website. And the big thing was that Editor Glenn Petersen put me on the cover of the magazine! For me that’s just like being on the Sports Illustrated cover. Thanks Glenn!! Thanks Jennifer Shahade for the online posting!